SINTESI CONTENENTE UNA BREVE DESCRIZIONE DEL LAVORO SVOLTO E DEI RISULTATI OTTENUTI: Skeletal growth relies on both biosynthetic and catabolic processes. While the role of the former is clearly established, how the latter contributes to growth-promoting pathways is less understood. Macroautophagy is a catabolic process that plays a fundamental role in tissue homeostasis. We investigated the role of autophagy during bone growth that is mediated by chondrocyte rate of proliferation, hypertrophic differentiation and extracellular matrix (ECM) deposition in growth plates. Here we show that autophagy is induced in growth plate chondrocytes during post-natal development and regulates the secretion of type II collagen (Col2), the major component of cartilage ECM. Mice lacking the autophagy gene Atg7 in chondrocytes experience endoplasmic reti culum (ER) storage of type II procollagen (PC2) and a defective formation of Col2 fibrillary network in the ECM. 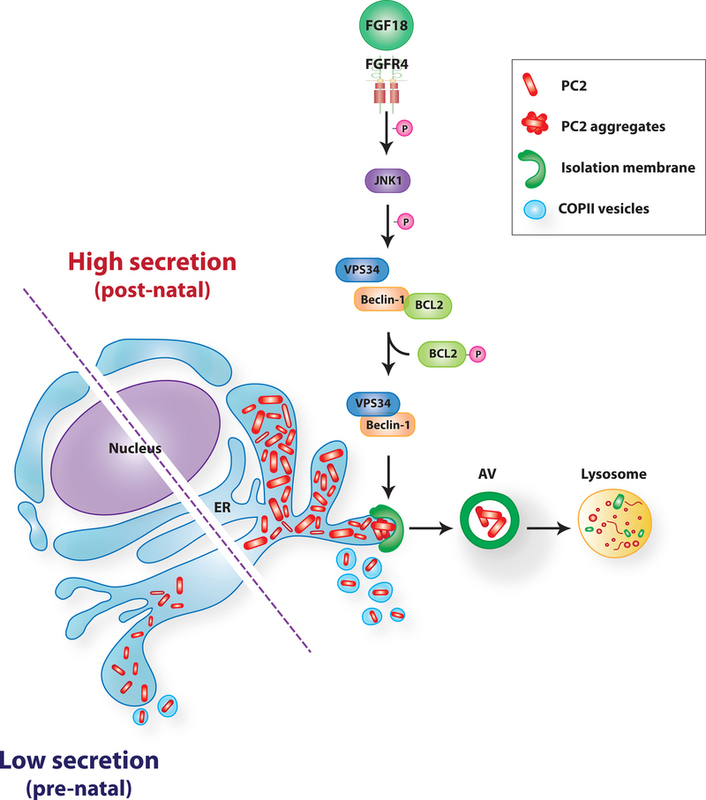 Surprisingly, post-natal induction of chondrocyte autophagy is mediated by the growth factor FGF18 through FGFR4 and JNK-dependent activation of the autophagy initiation complex VPS34/Beclin1. Autophagy is completely suppressed in growth plates from Fgf18-/- embryos, while Fgf18+/- heterozygous and Fgfr4-/- mice fail to induce autophagy during post-natal development and show decreased Col2 levels in the growth plate. Strikingly, the Fgf18+/- and Fgfr4-/- phenotypes can be rescued in vivo by pharmacological activation of autophagy, pointing to autophagy as a novel effector of FGF signaling in bone. These data demonstrate that autophagy is a developmentally regulated process necessary for bone growth, and identify FGF signaling as a crucial regulator of autophagy in chondrocytes.